More than 5000 spectators watched at the MHP Arena in Ludwigsburg, Germany, and many more on TV in Slovenia, as Ema Kozin became a two-weight World Boxing Federation (WBF) world champion on Saturday night, March 23. Already the reigning WBF World Champion at Middleweight, Kozin won the vacant WBF Womens World Super Middleweight title, scoring a unanimous decision, in a decent but unspectacular fight, over Sanna Turunen from Finland. Although Turunen was bleeding from a cut on the nose in the last round, she never looked in danger of getting stopped in the fight, but judges Herbert Urich, Andreas Mueller and Helmut Ranze all had her clearly behind at the end, with scores of 98-92, 99-92 and 97-93 respectively. 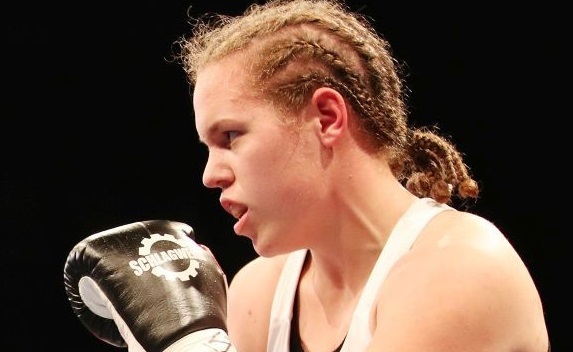 “The Princess” Kozin, a 20-year-old Southpaw from Ljubljana, is now the youngest two-weight WBF World Champion in history, she was only eighteen when capturing the Middleweight crown, and improves her record to 16-0-1 (8). Turunen drops to 5-3-1 (1).